Transmitter: Dimensions - 8.82" x 2.09"
Transmitter: Weight - 0.48 lbs. Receiver: Dimensions - 1.57" x 7.4" x 4.05"
Receiver: Weight - 0.53 lbs. 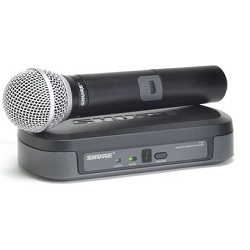 * Please call us for any questions on our wireless mic shure rentals in Shreveport and Bossier City, Louisiana.